Despite shipping from Canada, all prices are in US. I will be shipping to Canada and the US only, and am taking Paypal as the method of payment. Shipping is around 7$ within Canada, 10$ to the US, though it might change depending on quantity and location. I'm also up for haggling if you'd like. UPDATE: Now listing anime, manga, and books. Set prices are negotiable. 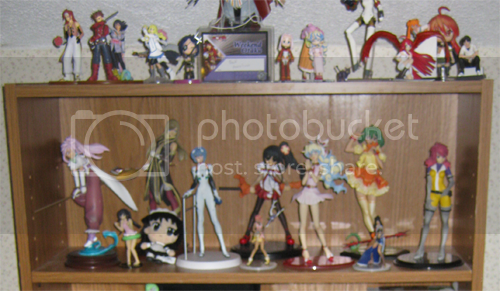 Also added individual pictures for figures under the cut. This is my first time selling on LJ, so bear with any mistakes I may make. Basically, I have school in the fall, and since I can no longer afford to maintain a figure hobby I'm selling some of the ones I own. I'm shipping from Ontario, Canada, and thus I will be using Canada Post, which means if you're in the US it might be a bit pricier. Offers should NOT include shipping, so tell me what you'd like (if anything!) and I'll determine a total with the price of shipping. I'll only be shipping to Canada and the US, however. Taking Paypal. If there's something you want, comment with your postal code and province/state and I'll figure out shipping costs. Figures are all used, but come with their original boxes and are in mint condition unless otherwise stated. The set prices are gone, and instead I'll be taking offers. Under the cut, I have some of the ones I really want to sell listed, but if something catches your eye, don't hesitate to make an offer! I'll part with anything at the right price, since I'm pretty desperate for reel cash munny. Also listed here: anime, manga, and related books. Icon post of experimental proportions!